How far can the iPad fall? Sales continue to slide, and Jason Snell wonders when we'll hit the bottom. The iPad is big in my house. I use one (Pro), my wife uses one (Air 2), my son uses one (Mini 2). Suffice it to say that we see the appeal. But at some point, even the biggest boosters of the iPad have to admit that something’s wrong. 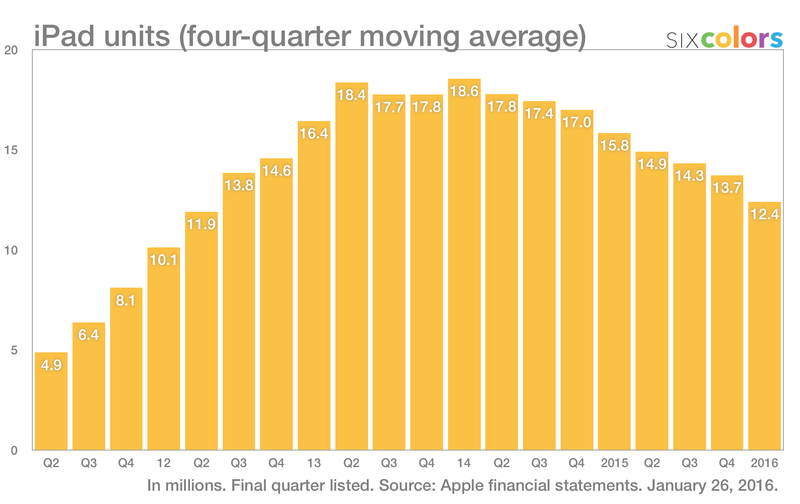 With iPad sales down year-over-year for 10 out of the last 11 quarters, it’s safe to say that this is more than a blip. Many observers have been waiting for a while now for the iPad to find its level—for sales to flatten back out and reveal what size Apple’s iPad business will really be going forward. It’s clear that the heady days where Apple sold 80 million iPads in a year are gone, and won’t be coming back for quite a while. 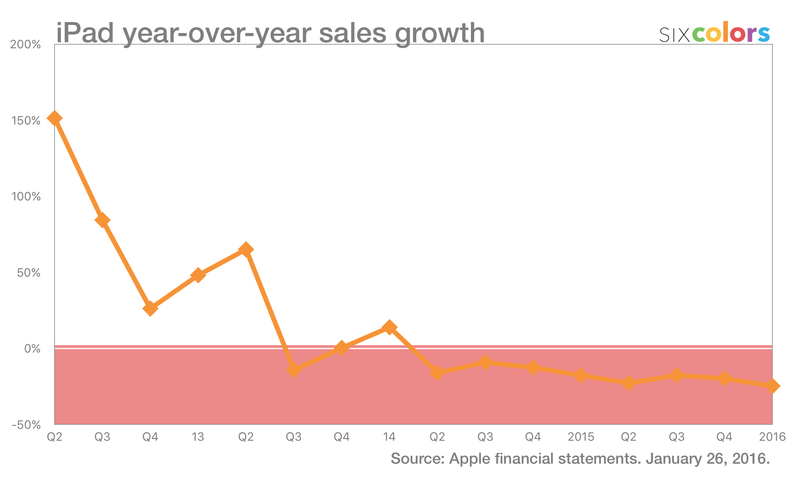 But as sales continue to decline, it’s worth asking when it will all stop. At this point, Apple’s selling iPads at a rate of approximately 48 million iPads per year—roughly the rate it was selling them in 2011, at the very start of the iPad’s lifespan, just before iPad sales kicked into gear. So is this the bottom? Or will it get worse before it gets better? This week on my podcast, Upgrade, my co-host Myke Hurley made a valid point: For all the talk about how impressive the iPad’s $20 billion per year revenue would be if it was a separate company—iPad Inc.—nobody seems to talk about what would happen to the executives of iPad, Inc. given the current performance of the product. They’d all be fired. It’s very clear, they’d be fired. Two and a half years of steady sales declines? Revenues down 40 percent? It would be a bloodbath. Time for some new leadership. 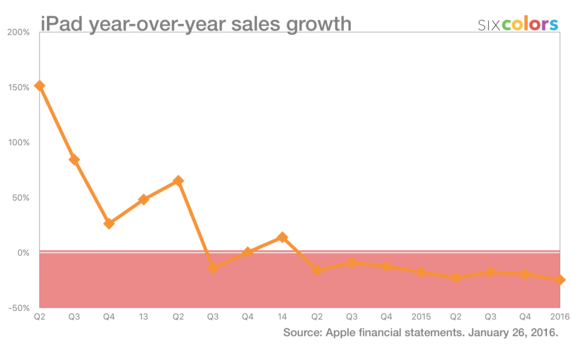 The iPad got physically bigger this year, but sales are still shrinking. Fortunately, the iPad is not separate from Apple. Apple, as a very large company, can afford to think big and create products to serve all sorts of different markets. 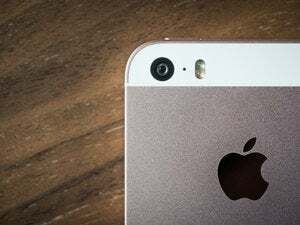 It’s okay with Apple if some people buy Macs, some people buy iPads, and some people—okay, pretty much all people—buy iPhones. The good news is, Apple’s current management does appear to be taking steps to right the ship. The multitasking and keyboard-oriented feature additions in iOS 9 were a first sign that Apple realizes it needs to put more effort into making the iPad a better device. The iPad Pro, with its Apple Pencil support and the new Smart Connector, is an exciting example of Apple innovating in the iPad product line separately from the iPhone line. No new Air. 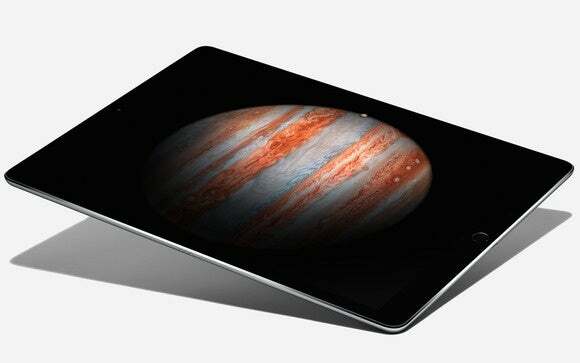 Apple failed to upgrade its most popular iPad line, the iPad Air, for the holiday season. The introduction of the iPad Pro is great (I bought one), and the iPad mini needed a refresh, but the best-selling part of the line was untouched. That’s not going to help lift sales. This can’t explain the historical drop, but it can explain why last quarter was weak. Nobody wants iPads. In 2010 and 2011 we all got excited and thought the iPad would be an amazing and cool addition to our lives, but after a few years it turned out that we’re fine using our smartphones and our computers. I’m sure there’s some percentage of the early iPad adopters who discovered that the iPad isn’t an essential product, but all the usage and customer-satisfaction statistics I’ve seen suggest that people who have iPads use them and love them. So I’m not sure this scenario can really explain things. iPads don’t need to be upgraded. I hear from people who still use the iPad 3, whose kids are still using the iPad 2, stories like that. It’s true, for a whole lot of uses the iPad can have a long, happy life. It may be that after that first flurry of iPad sales, people just haven’t need to replace their iPads. I think this argument has some truth to it, but I’m skeptical that it can account for the entire sales drop. Chromebook eats iPad eats Netbook. This argument suggests that the iPad has squandered its position as the teaching tool of the future, and Google’s Chrome OS has picked up the slack. I’ve certainly heard stories of Chromebook adoption in schools as well as frustration with iPads. It’s interesting that Apple is pushing education-oriented features into iOS 9.3 so that they’re available as schools plan purchases for the fall. My daughter loves her Chromebook and turned down my offer of an iPad Air 2. Here’s my theory. (Thanks for asking.) I think the iPad is a victim of its enthusiastic welcome. For a time, iPad sales grew faster than the iPhone, making people believe that the iPad was going to follow the iPhone into the stratosphere as a world-shaking product. We got caught up in the post-PC hype. The iPhone greased the skids for the iPad and made it an easier sell. The iPad may have peaked too early. As a result, the iPad reached a huge percentage of its target audience in a very short period of time. And once that audience was exhausted, it rapidly shifted into an upgrade-and-replace product cycle. Imagine a world where the iPad didn’t sell 67 million units in the first couple of years, but found its audience more slowly. We might end up with an iPad market just as large as the one we have today, but with a sales chart that looks much healthier. I do wonder, too, if the iPad’s initial success stunted its development. Apple is legendarily a company that won’t rest on its laurels and never considers a product good enough—the iPod nano replaced the iPod nano, yadda yadda. While Apple’s hardware designers seems to be keeping their feet to the floor, I wonder about software and services. I could make an argument that the App Store still has flaws that many people noticed on day one that are still unaddressed, and the easiest explanation is that the App Store has done so well for so long that nobody feels motivated to make changes, or is afraid to make changes because they’ll kill the golden goose. The iPad Pro's huge screen really shows off how badly Springboard needs a redesign. The iPad falls in that category. The day it was announced, many people noticed its weird home screen, upscaled from the iPhone with large gaps between the icons, and assumed that Apple would tailor that screen for the iPad eventually. Nearly six years later, it hasn’t happened. It’s easy to picture Apple managers looking at the success of the iPad and trying desperately to add features to iOS to counter Google and Android and deciding that there was no real reason to prioritize iPad-specific features. As football coach John Madden often says, “Winning is a great deodorant.” It’s only when things start to go bad that people start to notice the smell. I really do believe in the iPad. And I know Apple CEO Tim Cook believes in it too. On numerous occasions he’s said he’s “bullish” on its long-term success, although he noticeably avoided discussion of it at his most recent conference call with financial analysts. But where does it go from here? Rumor has it that there will be a new iPad Air 3 come March, with support for the Apple Pencil and Smart Connector. That may drive sales quite a bit, though it’s unlikely to affect the sales in this current financial quarter. I’d like to say that the iPad will settle in at an average rate of 12 million units per quarter, but I don’t think it’s going to happen. I suspect iPad sales will be down for at least one more quarter, and then may stabilize as people upgrade to the iPad Air 3. But I have to admit, that’s my optimism talking. I’ve come to love the iPad and I don’t think Apple will abandon it. In fact, the company now seems committed to improving it at a pitch that was lacking during its first few years of existence. Perhaps this couple of years in the doldrums will end up being the thing that turns the iPad around. Or perhaps I’m kidding myself, and in the end the iPad will be small niche product, an outsized iPhone accessory. As someone who loves his iPad, the idea that I might be part of a tiny enthusiastic minority in a largely uncaring world is heartbreaking. But looking at the numbers, it’s entirely possible that this darkest of narratives is, in fact, the right one.